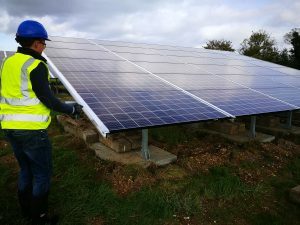 The 26,000 solar panels at Westhampnett began generating clean electricity in October 2018. The 7.4MW solar farm has been built with large on-site batteries, which means that surplus electricity can be stored and fed into the grid when the site is not generating. This helps to make maximum use of the green energy and means that this solar farm is the first in public ownership to be built without the need for government subsidy (feed-in-tariffs). Westhampnett solar farm generates enough green electricity to power 2,400 households. Being built on a closed landfill site, it also makes use of land that is currently unsuitable for public access or development because of methane gas. Like Tangmere solar farm, some of the electricity generated at Westhampnett is used to power West Sussex County Council buildings.